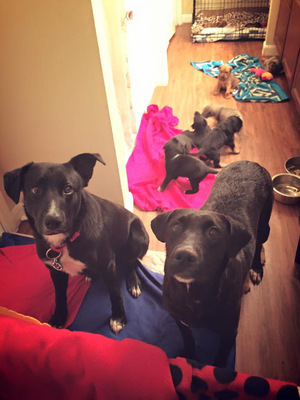 Dallas Dogrrr (rescue, rehab, reform) is a group of dedicated animal loving volunteers that are helping get stray dogs off the streets of Dallas. 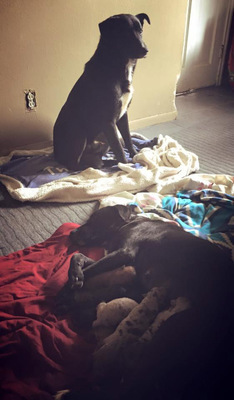 Dallas Dogrrr rescuer Marina Tarashevsce and dog behaviorist John Miller had been doing rescue work near a park when they say the black dog (who had eluded them for weeks) was now barking at them. Marina said it was not his usual bark, and behaviorist John agreed. The dog seemed to be asking them to follow him, so they did. It was a particularly icy night and Marina and John thought that maybe he was injured, so they slowly approached, but each time they took a few steps toward the dog, he would back up a few steps. This happened over and over again, every time they would take a few steps toward him, he would bark and back up. This continued until they were in a densely wooded area and then they heard the sound of PUPPIES!!!! This incredible dog led his rescuers Marina and John to a malnourished, very weak mama dog and 10 very sick puppies. It is unknown if the hero dog who led them to the bushes is the papa, or the uncle, or just a friend, but he is responsible and fully credited for saving their lives. 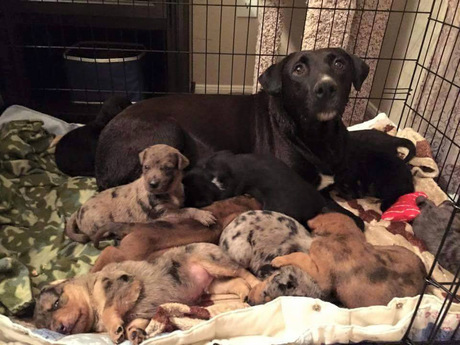 Upon rescue the hero dog was aptly named Hero and the mama dog was named Mona. Hero has found his forever home. He is king of the empty nest and pampered like a hero deserves to be. He loves toys, dog parks and walks with his new family. Mona is in foster care. She was most likely born feral, in the park and is warming up to her foster and learning that she no longer has to fend for herself. She is getting some much needed love, affection and time to acclimate. 7 of the 10 puppies have been adopted and the other three are in foster care eagerly waiting to meet their forever families. 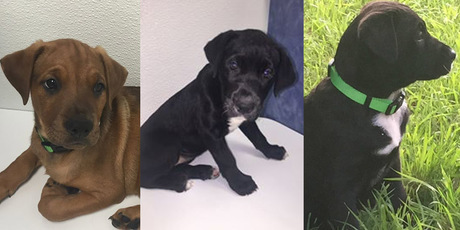 Contact Marina at Dallas Dogrrr if you’re interested in adopting one of these little survivors!